My 1999 won't start. My first bike. Edit: I have updated this post (24-04-2017) and again 14-05-2017. I just got my very first bike, a 1999 CBR1000f. I've had it for a few weeks now and been riding it without trouble. I'm in my late 20's with absolutely no mechanical knowledge. Last night, I went out for a ride and it started and drove well. 15 hours later, come morning, I try to start it up again. I hit the ignition after pulling the shogun all the way down. After a few hisses the engine starts and it fires up well and sits idle for a 2-3 minutes. At this point, I give it a gentle throttle (neutral gear) and it suddenly shuts off. I try to start it again, shogun down, clutch in, ignition. It hisses and tries to catch on, RPM's goes up a bit (needle moves back and forth), it get's a little bit momentum but dies out again. I repeat this process 6-8 times in utter frustration and at this point I am quite aggressive on the shogun. A week pass and I take my motorcycle to a mechanic friend of mine who tells me it's probably not a big thing. After many attempts he get's it going by using a very large battery (many amps) and some thick cables. It idles fine and sounds fine. I drive it five blocks back to my appartment and use it the following two days without trouble. On the third day, the exact same thing happens. I hit the ignition, it hisses and rumbles and I feel I have to give it some throttle to get it going. Gently giving it throttle it fires and idles (with choke on and no throttle) for about 1 minute. At this point the RPM's begin to decline and it eventually dies. I try to fire it up again but all i get is a hissing sound. - Installed new spark plugs. - bought a new battery. - There's plenty of fuel. I start her with the petcock on reserve. - The choke cable does engage fully on the carb. For anyone looking at this thread who might have the same problem I can only support the advice given to me in this thread. Carefully clean and adjust the carburetor, it was the main culprit here. The battery needs to be fully charged (fully!!) and you need to be patient with the ignition as it might not fire up right away. Carefully follow the ignition routine and don't fiddle with the choke until she is warm or you're running on a stretch of road. Don't open up the throttle when trying to start it - it'll negate the vacuum created by the choke in the carburetor. For the complete uninitiated such as myself, DO remember the idle speed **** on the left side of the motorcycle, freely accesbile through two plastic cover slits. This needs to be adjusted correctly. You want an idle speed of around 1050RPM's. Mine is at 1100-1200 currently but I haven't synchronized my carburetors yet. Many people, I am told, adjust the idle speed **** when the carburetor get's a bit dirty and so it can be difficult to start once you have it cleaned. Last edited by Apollon; 06-20-2017 at 07:59 AM. Welcome to the forum Apollon, sorry to hear you are having troubles. You are correct, the spark plugs are under the rubber boots you have highlighted, but firstly when starting the bike don`t use any throttle, just use the choke, let it warm up on the choke until revs rise by themselves then back the choke off slowly as idle settles/smoothes out. You can just leave a flooded bike for an hour or so and it should come right by itself without having to remove spark plugs and cleaning them. Someone with more knowledge will soon offer more advice to what I have given you. Don`t get too disheartened as these old bikes rarely have any major problems to be concerned about. This really eased my soul. Try to start it again pulling the Choker/shogun down all the way and no throttle. See if it idles. It indeed feels like the battery is quite weak now after all my attempts. I'm parked on a hill, will push starting it in 2nd gear downhill perhaps do the trick? I just don't know what I did wrong. I thought I was supposed to give it a little throttle while warming up the engine (I believe it says so i the user manual too!). I managed to install new spark plugs earlier today. The spark plugs I took out looked brand new though. I turned the new plugs using a wrench a 1/4 and so not too tight. However. I couldn't get it started. Even using jumper cables from a car and another battery (clearly giving it a lot of juice) I was unable to breath live into it. It just seems like it won't catch on/fire, it hisses and I can hear the starter motor struggling but there is clearly no combustion going on. It points to a fuel problem OR that my battery is dead. I do have a feeling that is a minor thing though. Everything seems in order. - Put a lot more fuel in the tank. - Buy a new battery and install it. Then I will have Fuel, Spark and Electricity. That's all I need, right? If this doesn't work, It'll probably be beyond my mechanical knowledge to fix it and then I wouldn't know what to do. A new battery on a bike new to you is always a good move. Like the Jarvid says, full choke when cold, TURN THE LIGHTS OFF ON THE BIKE, that'll give you full volts and amps to the ignition and starter, press the starter, when the bike fires up leave it to run, NO THROTTLE, as she warms up the engine revs start to get high, reduce the throttle to a comfortable rev range, after a couple of minutes shut off choke and she should run . Turn the light back on. Hi Apollon, welcome to the forum. The advice the guys have already given you should get you started. A jump start with leads from a car, should provide enough power to get the bike started, but it will need a good long ride to fully recharge the battery and as you said, make sure the car is not running!! I got it started and I feel a bit silly since, I assume, it was a discharged battery. However, I don't really understand what happened. Perhaps I flooded the engine initially, and discharged the battery trying to get it started. 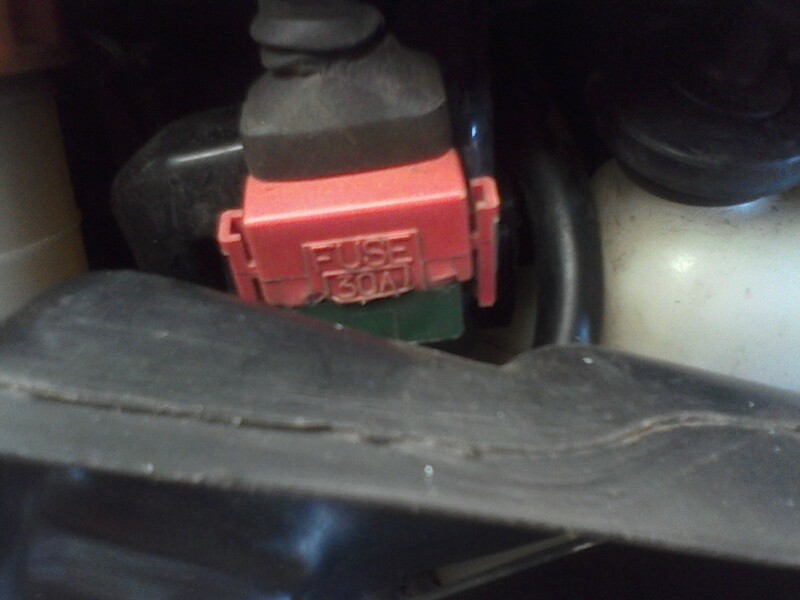 I've been driving a lot using the kill switch, so I think this added to a drained battery. I took the bike to a mechanic friend of mine and he hauled out a battery and some cables, tried starting it. It didn't turn. He pulled out an even bigger battery and still it wouldn't start. Again, he took an even larger battery (many amps) and it wouldn't start. I'll be damned he said. Then he went and got some thicker cables and that turned the engine. What worries me is that I couldn't get it started using a car (engine running) and cables. Neither could I bump start it. Even more perplexing is the fact that, after my mechanic visit, I only drove it a few blocks back to my appartment. Next day, thinking I couldn't start it, it started. I've been able to start it three times now but had a bit of trouble at a gas station yesterday. I'm really worried I'll be stranded somewhere. What would the solution be? Mechanic said he drives around with a powerbank and replaces his battery yearly. In any case, this bike in particular seems to demand a lot from the battery. Sound like an earthing issue. Tell me, does the starter when it turns spin fast, slow or struggles to turn at all.? Pic of solenoid, with fuse holder. God damnit. I'm not able to start it again. I even changed the battery! I'll try what you described just now. The exact same thing happened. I turned the key, choke down, cluth in and ignition. It struggled a bit and I felt I had to give it some gas. It fired and went up to 5000rpm, i released the gas and it idled at around 2000-3000rpm with the choke. After about 30seconds it started slowing down, the RPM's declined until the needled jump at the far end of the RPM gauge. It turned slowly, clearly struggling to turn the engine around. I tried starting it up again. It fired but quickly died down again. I tried again, it coughed a bit but wasn't able to turn the engine. I went to get a new battery (an hours drive on my bicycle there and back, fml) but still it won't fire. It doesn't even cough now. It gives that starter sound that's all. I'm at my wits end. I got it started using a very large battery and some thick cables the other day so that would point to an electrical problem. The thing is, this bike seems, in every way, very new. It's from 1999, everything stands out pristine. I have no knowledge about these things but it would surprise me, based on this feeling, if there were a leak or tear in any cables. I haven't seen any. Does the starter spin fast or v.slow? Quick Reply: My 1999 won't start. My first bike.